Geoweb is een product dat instabiele ondergronden stabiliseert. Geoweb is een honinggraad structuur samengesteld uit gelaste HDPE stroken die cellen vormen en op deze wijze de vulling samenhouden. De vulling kan bestaan uit doorgroeibare producten zoals zand, grond, puin en grind. Als niet doorgroeibare optie kunnen de cellen zelfs met beton gevuld worden. Geoweb is geschikt voor erosiecontrole en grondstabilisatie van (tijdelijke) wegen, spoorwegen, voetpaden, waterlopen, keermuren, taluds, wegverbreding etc. Constructies waarin Geoweb is toegepast zijn geschikt voor hogere belastingen en hebben een natuurlijke afvoer van het oppervlaktewater, ze kenmerken zich als een duurzame oplossing met lage exploitatie- en lage onderhoudskosten. Unprotected road verges unable to support active vehicle loads can potentially become very dangerous. To avoid rutting and to stabilise poor road verges, GEOWEB® is a proven and cost-effective solution for providing stable, vegetated road verges. a certain degree. The resulting horizontal load distribution minimizes stress on the subsoil and significantly reduces deformation compared with conventional unconfined soils respectively substructures/constructions. The GEOWEB® system is a three-dimensional honeycombed structure made of high density polyethylene (PE-HD). The overall stabilising effect is achieved by each single cell and the cell walls. The GEOWEB® cell hoop strength, passive resistance of adjacent filled cells, and frictional interaction between the infill material and the cell walls contribute to the support structure. When concentrated or distributed loads are imposed on the surface, the cell walls retain the infill material preventing shearing and horizontal movement, which reduces lateral deformation. Due to the structure’s retaining influence, the granular infill material achieves a higher stiffness and apparent cohesion. The benefit of GEOWEB®-stabilised construction compared to a non-stabilised system is a much higher load-bearing capacity. Depending on the required construction finish (vegetated/ non-vegetated) and the anticipated loads and frequency, a variety of compactable filling materials are possible. For vegetated road verge stabilisation, a mixture of topsoil and aggregate/ gravel is recommended to provide stability and a medium for vegetative growth. Why use the Geoweb ATRA KEY Connection Device? There is a more productive, economical way to connect Geoweb sections, especially when site conditions, location and size make ATRAKey1usingstaplers difficult or inefficient. The Presto ATRA Key is a turn-key device designed to save installation time/cost on sites and eliminate the hassles of stapling. With one easy turn, ATRA keys are easier and faster than using staplers, allowing Geoweb sections to be connected nearly three times faster. They’re also three-times stronger than staples, giving a more secure and longer-term load-transfer connection. rods, they make in-line, easy to drive anchors. When used with ATRA drivers, driving anchors is quick and easy, even in hard soils. Reduce physical stress on your workers and significantly improve their installation productivity. Experience a better way to drive anchors and dramatically reduce your labour costs and worker fatigue caused by hand hammering. Installing Geoweb sections on slope and channel projects that require large quantities of ATRA® anchors? Driving long anchors orinstalling anchors into hard soils? 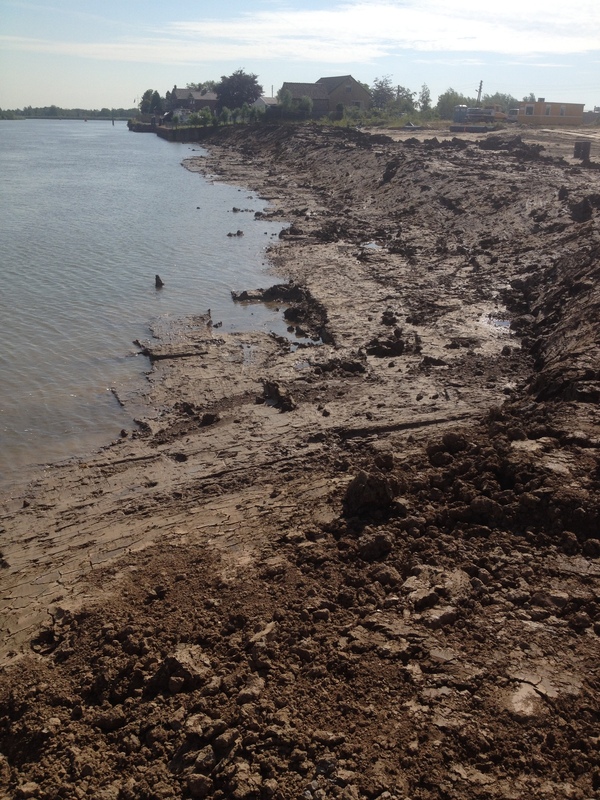 The GEOWEB® Shoreline Protection System stabilises soils on shoreline embankments, creating a structurally stable environment for infill. The system minimizes erosion problems caused by water contact, surface flow and small scale wave action. • Confines and reinforces the upper soil layer. • Provides resistance to erosive conditions and slip forces. • May be integrated with a turf reinforcement mat (TRM) for higher protection for vegetation. • Protects geomembranes on ponds, or stormwater/wastewater containment basins. permeable aggregate or hard-armoured concrete. forces. With a TRM cover, offers better resistance to soil loss caused by soil saturation. steeper slopes than when unconfined. With concrete infill, the GEOWEB® system is a less costly, flexible alternative to articulating block systems. Design retaining walls with natural aesthetics that perform in less-than-ideal site conditions. Construct structurally-stable, low-impact development retaining walls that reduce stormwater runoff and help meet green building goals. The multi-layered Geoweb® Retaining Wall System creates economical and structurally-sound retaining walls that meet all design requirements and desired aesthetics through a terraced vegetated face. Use of less expensive on-site infill materials saves cost. Faster construction saves cost:Compact and light-weight sections are easier to handle, deploy and construct even in difficult-access or remote locations. Handling of light-weight sections compared to heavier block systems reduces worker down-time. The Geoweb retaining wall system’s open-celled horizontal terraces create a natural environment for sustainable vegetation. The vegetated system allows rain water to collect through the wall fascia, maximising stormwater collection, and minimising runoff. 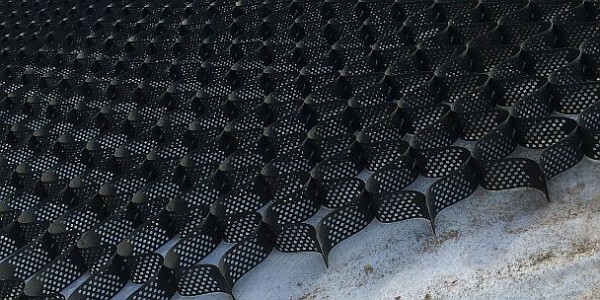 The GEOWEB® Channel Protection System stabilizes and protects channels exposed to erosive conditions of all types and can be designed with appropriate infill types to withstand even the highest velocities. Replaces costly, higher-maintenance rip-rap with lowermaintenance, less expensive, stabilized vegetation. Effective in low-flow channels and when low-to-high intermittent flows occur. With a TRM, the vegetated GEOWEB® system can withstand velocities as high as 9m/sec. Ideal for drainage ditches, swales and stormwater channels. Aggregate confined in the GEOWEB® system is far more stable than when unconfined. As a result, rather than using large, difficult to handle rip-rap, smaller and less expensive infill can be used in low-to-challenging flow conditions. Concrete-filled GEOWEB® structures are ideal for channels exposed to severe hydraulic stresses. Concrete is poured in the structure onsite, creating an easy-toinstall, flexible yet hard-armored system that is less costly than pre-formed concrete systems. GEOWEB® multi-layered, vegetated channels create natural living retaining walls that can withstand high flows for short durations. They tolerate differential settlement while maintaining their structural integrity, and are quicker and easier to install than typical block systems. The benefits of three dimensional confinement are long-term vegetated sustainability, reinforcement of the upper soil layer and resistance to erosive conditions and sliding forces. The system reinforces vegetation, increases resistance to erosive forces and prevents rill development caused from concentrated flows. Confinement in the GEOWEB® structure allows smaller, less-expensive materials to be used, and on steeper slopes than when unconfined. 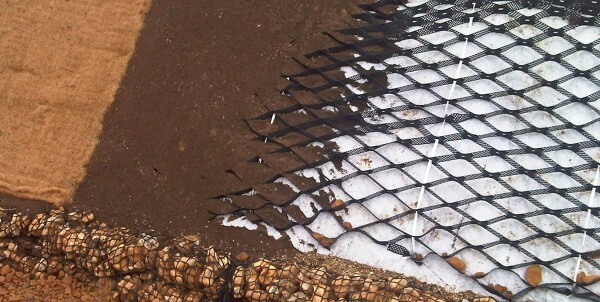 The system offers effective cover protection for impervious geomembranes. A tendoned-anchoring system offers structural support and protects the integrity of the liner. Genuine Geoweb® Load Support System is a proven cost-effective solution for challenging soil stability problems. Geoweb load support system is an easy to deploy economical solution for roads and tracks in difficult to access locations. Geoweb access roads support heavy plant and vehicles, reducing costs to quarry, forestry, windfarm, agricultural and similar applications. Joining panels with Atra® Keys and Atra Anchors makes an installation up to 3 times stronger than using staples and can be a contributing factor to the speedy completion of projects. May allow use of lower-quality, less costly site won infill materials. Allows subgrade materials to withstand more than 10 times the number of cyclic load applications before accumulating the same amount of permanent deflection. Creates a stiffened base layer, and the resulting increase in base strength can be used to reduce the pavement depth design up to 50%. Presto offers its free, licensed GEOWEB® MSE design software for GEOWEB geocell wall applications. The software creates vegetated and non-vegetated MSE designs based on the GEOWEB® system for reinforced slopes, and for gravity and geogrid-reinforced walls. The easy to use software is based on industry standard design methods and contains specific algorithms that capture the unique interaction between the GEOWEB® system, infill and backfill soil, and geogrid reinforcement and specific factors of safety. contains a quick link to Presto’s SPECMaker® Specification Tool, a user friendly online program to build customiSed CSI-format specifications. The combination of the GEOWEB® MSE and SPECMaker® Tool offers design and engineering firms a fast intuitive toolkit for creating design and specification documents. We all want the highest quality products (but are we willing to pay for them)? We all want services included (but are we willing to pay for them)? What happens if we settle for less than the highest quality materials and don’t receive support for a product we know little about? Could we be putting our project at risk of failure? Read this document to find out the 7 most important Key Factor to choosing the right geocell. It will save you money in the long term. ATRA® Tendon Clips are load transfer devices that transfer slope gravity forces from the Geoweb cell wall to the tendon. ATRA Tendon Clips connect and “lock” securely through the Geoweb cell wall slots allowing for preassembly at the top of slope, reducing worker strain and speeding installation. The tendon loop is much easier to complete with the ATRA Tendon Clip, ensuring the tendon remains tightly wrapped. The ATRA Tendon Clip’s strong design reduces by half the number of clips or load transfer devices required per Geoweb section, saving time and money for the contractor. The ATRA Tendon Clip is Presto’s preferred device for load transfer when tendons are required.